Colonel of N.C. Militia at Battle of King's Mountain. Delegate to the Hillsborough Convention, 1788; in General Assembly, 1793. Grave is 4 mi. N.
A frustrating military career and a life of public service characterize the contributions of Richard Allen. 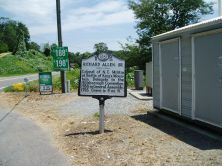 Born in Maryland in 1741, Allen moved to Rowan County in 1770 and became an integral member of the community until his death at the age of ninety-one. The portion of Rowan County along Big Bugaboo Creek where Allen lived became Surry County soon after Allen moved there. Just a few short years later, Allen served the newly created Wilkes County as its first sheriff in 1778 and then represented the county at the Hillsborough constitutional convention. His other public service achievements included serving a term in the House of Commons in 1793 and as Wilkes’ sheriff again from 1798 until 1804. The most interesting and surely frustrating part of Allen’s life revolves around his attempts at service during the Revolutionary War. 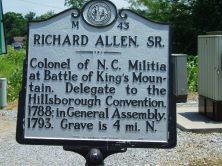 Allen was among the first to volunteer for service as a minuteman. Allen and other members of his company marched to Cross Creek to assist in the actions at Moore’s Creek Bridge, arriving too late to participate in the battle although they were given the charge of marching captured prisoners to Hillsborough. Before the group arrived in Hillsborough, they were met by other troops who assumed control of the prisoners and Allen’s unit was dismissed. He returned home and his first six-month term as a soldier expired. Allen re-enlisted and was promoted to captain of a company, a position he held the rest of the war. Allen’s company was ordered to aid in the defense of Charleston. However, through delays not of his making, Allen and his company were discharged and sent home before the battle. At home again by 1780, Allen answered the call for troops to assist at Kings Mountain and re-organized his company. Allen was detailed as a rear guard to advancing forces and, again, arrived at Kings Mountain too late to participate in battle. He then joined Greene’s forces in the Piedmont after the Battle of Guilford Courthouse, missing yet another major battle. Allen attempted to participate in many of the South’s key battles of the Revolution was but forestalled at almost every attempt to engage the enemy in a pitched battle by a variety of factors.